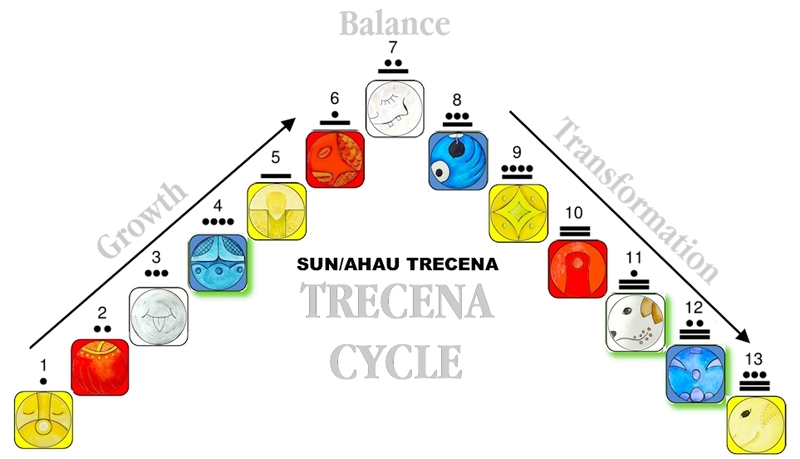 Peak Tone 8 begins the Transformation phase of the trecena. Our Growth phase was compared to a climb, and Transformation compared to a descent. We powered the way up. An Unseen Power will draw us forward the rest of the way. Tone 8 holds the Intention of Divine Justice. Our “descent” illustrates the Unseen Power of Divine Intervention. Every Ascension is built on the Higher Ground of the last trecena. Deer/MANIK was the Day Sign that guided our last journey. MANIK returns on Tone 8 to complete its Meaning and Purpose. We’re reminded on the Holy Day that the Truth we see will never be Unseen. We never lose the Higher Ground we’ve reached by Intention. We will never go back to seeing things as they were before, once we are Conscious of the Truth. Each new Truth is a permanent Light to our path. 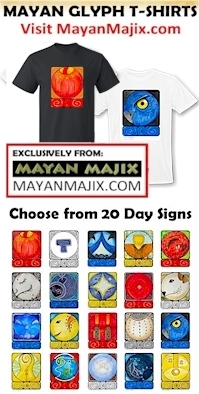 The Maya see Tone 7 of Reflection as the threshold of Spirit, their closest place to the sky. Though the energy is one of a descent, the Maya reflect on a mirror image of the stairs that continue upward into the realm of Spirit. Tone 8’s “gravity” of an Unseen Divine Power is actually drawing us to a Higher Place. Most of the Mayan celebrations, ceremonies and festivals are carried out on Tone 8. On Tone 8 the Intentions Above and Below are in Balance with each other. The zenith hour is the zero point between darkness and light. Deer/MANIK is the Day Sign of the Mayan priest, given the Mission to serve as the Hand of God on Mother Earth. MANIK reflects the Meaning and Purpose given to Human. Deer’s Mission is our Reason to Be. The Maya observe 8 Deer/MANIK as a Day to Honor the Meaning and Purpose of our Divine Destiny. Today is the Initiation Day for those who have dedicated themselves into service. 8 Deer/MANIK carries out the Initiation of the Mayan priest. Today, the Sacred Fires are burning in Guatemala. Jen, our Daykeeper friend at Lake Atitlan shared the photo above of a gathering for Sacred Ceremony. Red is the color of the East, the place of Divine Inspiration, and a color that represents Spiritual Medicine. The Mayan priests are recognized by the red covering on their head. The place for the fire is marked by a Medicine Circle. In the North, the circle is drawn with cornmeal in a clockwise direction. The K’iche Maya in the South lay it down counter-clockwise. The fire ceremonies of the North and South traditions spin in opposite directions, connected as spiraling vortex of Divine Energy. The cross of tobacco is laid in the center North to South and East to West. Instead of the floral water used by the Andean priests, the Maya priest uses tequila to bless the place of the fire. The ceremonial fires of the Maya are embellished with colored candles, the aromatic of copal, tobacco, sugar, candies or chocolate, and many flowers, illustrating the Sweetness of Life, the Beauty of Spirit, and the Smoke that carries our Prayers to the Creator. Those who have chosen the Deer’s path are called to the fire today. They are Initiated into Divine Service, called to be recognized and received for an Initiation of Spirit. Initiation is a Sacred Ceremony that identifies the Spiritual Distance we’ve traveled. There are many Initiations on our path to Higher Consciousness. These were the traditions carried out by our Ancestors. Initiations are integral to every tradition of Spiritual Development. Initiations mark milestones of Consciousness. We remember Initiations as the marks of Higher Ground. Every 13 is an Initiation to the Higher Consciousness of Ascension. In today’s world, many who have Chosen the Path don’t have a Medicine Circle or spiritual community to carry out this ceremony on our behalf. The Elders say it is always Good and Worthy to Initiate our Self. The Intention of Divine Justice, made every provision for Equity. By the same Truth, the Rituals and Sacred Ceremonies fundamental to our Divine Communion, are just as Perfect when they are carried out in Spirit. Nothing of the world could ever separate us from our Divine Relationship with the Creator. 8 Deer/MANIK presents us with Time for this Sacred Purpose. We are all connected in the realm of Spirit. Today these fires burn for all who have made a Choice to follow a Mission of Spirit. They burn for us. The Sacred Fires burning today are waiting to receive us in Spirit. This morning the fires are burning here. Sage and sweetgrass are the tradition of the North. On Mayan Holy Days I like to burn copal, the traditional aromatic of the Maya. If none of these materials are available, Bay Leaf (Laurel Leaf) is also used as a Sacred Aromatic you may have on hand. Deer/MANIK holds the Element of Water. Water is the element that holds the Ether of Spirit, used for Blessings, Purification, and Baptisms. You can Bless your Self with Water, sanctified for the purpose. This is your own priest’s ceremony. You can wear a special head covering, garment, or prayer shawl. You can bring flowers and light candles at your own altar. Bless every element that is used. Seeing and Acknowledging them Honors the Sacredness of their purpose. The Elders say to always ask permission of all the Elements of Mother Earth. At a ceremony of Initiation, we would be smudged off. The Elders asked that we place our Spiritual Tools near the Fire to receive a Blessing on Holy Ground. You might Choose a Sacred Object to be Blessed for your altar. As a symbol of a journey, you might consecrate a Staff. This is a day for Blessing Spiritual Tools of your own creation. Sacred Objects are made so by our own Intention. When we associate a Divine Memory or Intention with a physical object, it holds the Sacred Power of the Intention. Whenever we use it or hold it, we’ll remember the Intention. The Power of a Sacred Object grows over time, like we do. Today holds a Purpose to Identify our Self by the Divine Choice we made. Within the Choice is the Truth of our Divinity. Our Human consciousness only knows the false truth of our limitations. Only our Divine Spirit Knew there was something Higher to reach for. The Deer/MANIK glyph illustrates the Hand, another name for MANIK. Between the forefinger and thumb, the Hand grasps the Ether that completes a circuit of Divinity, the Source of Almighty Power. AHAU’s Revelation in the zenith hour is that it wasn’t the human hand that reached. It was the Hand of our Spirit. We reached BECAUSE we are Divine. Our Divine Spark was drawn by an Unseen Force back to our own Divine Source of Power. Our Initiation marks the completing of a Divine Circuit of Power between the Balance of Divinity, Above and Below. Our Spirit is not of this world, but the Ether of the One Divine Consciousness. Human’s Sacred Purpose is to make the journey in the world, not to be a part of it, but to be the Divine Observer. Only by paying attention to the world around us, will we see our Dream manifesting into Human blessings. The Deer upholds the Pillars of Love, through Vigilant Observation in all 4 directions. Deer leaps when it sees a Higher Ground of thought. It’s observation leads it to the places where Love is needed. It’s talent for pushing negative thoughts away, is accomplished by measuring Higher Thoughts. The Cherokee Deer is defined as the Stag, the Mature Deer. The herd includes the Whole. We are the Sprout in the 3rd uinal, just learning to make our way in the Light. We’ve completed our first climb. We could imagine the place of our Intention as the young Deer, not the Bambi, but the Youthful Deer that has learned to stand on its own legs by a journey to High Places. MANIK touches our Heart with Unconditional Love. Our Consciousness of Love is reunited as One. Today is a milestone in your life. Look at where you’re standing. This place is Your Holy Ground. You were drawn here by your own path to this Sacred Time and Place. With all your limitations and human perspectives, it was Your Path that led you Here. In an Initiation of Spirit, Honor YOUR PATH, defined by all the Choices you made. Through the Sacred Right of Choice, you held the Sole Authority of the direction. You are the Author and Legislator of your own Divine Choice. Both the wise and unwise choices you’ve made led you to recognize a Divine Identity. We only See Failure when we Hold a Higher Intention. All the lessons were made just for you. All the experiences were created by your Response. By Divine Design, the Truths you’ve learned were synchronized to your own Experience. Today you are standing in the Perfect Time and Place to see the Truth of your Self. We each have our own path. No two of us will ever stand on the very same Truth. Our Divine Truth rises to a Higher Discernment with each Experience of Intention. Our own Truth is Divinely Timed. All our experiences are stored in our Consciousness so we can return again and again to see our Truth from a Higher Perspective. On the Tone 8 of Divine Justice, we are made Conscious of the Creator’s Intention of Harmony and Equity for the Whole. No matter what Truth we’ve been Divinely Inspired to stand on, we are standing in our own perfect Time and Place. No matter how late we started, we are all promised to arrive at our Divine Destiny at the same time. We can imagine our Divine Destiny as a Collective Divine Consciousness of One Another. Our Destiny is to Know, Together that, as different as we are, we are all part of the One. We would all see one another as Lights of the One Divinity, all the Possibilities, and all the different Expressions of the One Love. It’s a Destiny we could only Know Together at the same time. Through an Initiation, we are offered a Divine Vision of our Self, and the Sacredness of the path we chose. Our Revelation is a Divine Demonstration of Deer/MANIK, a Mission to see one another in the Light of this Truth. We would hold the Passion to Love, Knowing that all the ones we would cast as “the other” HAVE to arrive with us too. Each living thing we Honor by Seeing and Acknowledging their Light will be drawn with us toward the Light. Deer/MANIK holds the power of Harmonic Resonance. The Pure Vibration of Divine Love, naturally draws lower vibrations into sympathy. We are drawn to those who acknowledge the Light in us. They offer an Initiation by Seeing and Acknowledging our Spirit. When we Honor the Light in each other, we leave behind the same memory of an Initiation that crystallizes a memory of Divinity. This is the Mission that fulfills our Meaning and Purpose, to Know the Experience of being Gathered to the Light. Truth and Love lies at the Heart of all the Deer’s Spiritual Tools, the very foundation that upholds the Pillars of Creation. Today we are connected to our Divine Source of Power. Our Revelation will be an experience personal to us. Today we can be grateful for all our own circumstances and lessons that brought us here. The Wisdom shared by the Elders on the occasion of Sacred Ceremonies and Vision Quests is the teaching about “Holding Power.” Our personal experiences with the Creator are beyond human explanation. The Elders guided us to leave the experience in the Ether of our thoughts for a time. Our experiences hold an unlimited potential for Divine Discernment, until we crystallize them by definition. Something of the Power of the experience can be lost when we try to share them. The words we use won’t explain it. I’ve regretted sharing some experiences when they weren’t understood. Something of the the “magic” was lost by an outside interpretation. We were told after the 4-day Sun/Moon dance ceremony to not speak of our experience for 3 months. If you are conscious of this, you will know your own time. You will know when the thoughts you share have been crystallized as your Own Truth. By “Holding your Power” the Blessing you share will be Multiplied to Abundance. Today my heart is drawn to the Light I see in you. When I look down at the Time and Place where I am, I know it wasn’t possible without you. You helped to create a path for me. All I was doing when I started was reaching for a Light of Salvation, something that could turn my own darkness into light. I was looking Above, and found it through you. The fire at my Sacred Altar burns for me and you and the paths we are creating together. I hold a vision of all the threads of our Ether as Light being woven together. Our Relationship as a herd of Deer is Divine, because we’ve already seen the Light of our Destiny. We are given the gift to see that we are already standing in the Presence of the One that is all of us. Our Hearts can Leap as One. To all my relations, today I hold a Vision that we are drawn to the Sacred Fires. The smell of copal reminds me of all the Maya that will be gathered there too. We’re standing side-by-side in Spirit with all who have chosen the path. We are all called forward by name in the same moment to receive the Blessing of Holy Water. I imagine the mountains we’ve each climbed to arrive at this place, coming from all parts of the world and many different experiences of Life on Mother Earth. I honor the Dream we share to be Free and Happy in Harmony with the Whole. May the Truth we Stand on be that every Deer’s Mission is an Expression of Divine Love. May we mark the occasion to remember the Sacred Event when we Recognized our own Divinity. Thank you again for your Dream. Thank you for seeing our Light. Thank you for bringing us closer to Ourselves and Each Other. A Fire burns here too. You reminded me where I was heading to.